Ormandy conducting the Philadelphia Orchestra. Ormandy was born Jenő Blau in Budapest, Austria-Hungary, the son of Jewish parents Rosalie and Benjamin Blau, a dentist who was also an amateur violinist. Ormandy began studying violin at the Royal National Hungarian Academy of Music (now the Franz Liszt Academy of Music) at the age of five. He gave his first concerts as a violinist at age seven and, studying with Jenő Hubay, graduated at 14 with a master's degree. In 1920, he obtained a university degree in philosophy. In 1921, he moved to the United States of America. Around this time Blau changed his name to "Eugene Ormandy," "Eugene" being the equivalent of the Hungarian "Jenő". Accounts differ on the origin of "Ormandy"; it may have either been Blau's own middle name at birth, or his mother's. He was first engaged by conductor Erno Rapee, a former Budapest friend and fellow Academy graduate, as a violinist in the orchestra of the Capitol Theatre in New York City, a 77-player ensemble which accompanied silent movies. He became the concertmaster within five days of joining and soon became one of the conductors of this group. Ormandy also made 16 recordings as a violinist between 1923 and 1929, half of them using the acoustic process. Arthur Judson, the most powerful manager of American classical music during the 1930s, first heard Ormandy when he conducted (as a freelancer) for a dance recital at Carnegie Hall by Isadora Duncan; Judson later said, "I came to see a dancer and instead heard a conductor.". Judson greatly assisted Ormandy's career, and when Arturo Toscanini was too ill to conduct the Philadelphia Orchestra in 1931, Judson asked Ormandy to stand in. This led to Ormandy's first major appointment as a conductor, in Minneapolis. Ormandy served until 1936 as conductor of the Minneapolis Symphony Orchestra (now the Minnesota Orchestra). During the depths of the Great Depression, RCA Victor contracted Ormandy and the Minneapolis Symphony for many recordings. A clause in the musicians' contract required them to earn their salaries by performing a certain number of hours each week (whether it be rehearsals, concerts, broadcasts, or recording). Since Victor did not need to pay the musicians, it could afford to send its best technicians and equipment to record in Minneapolis. Recordings were made between January 16, 1934, and January 16, 1935. There were several premiere recordings made in Minneapolis: John Alden Carpenter's Adventures in a Perambulator; Zoltán Kodály's Háry János Suite; Arnold Schoenberg’s Verklärte Nacht and a specially commissioned recording of Roy Harris's American Overture based on "When Johnny Comes Marching Home". Ormandy's recordings also included Anton Bruckner's Symphony No. 7 and Mahler's Symphony No. 2, which became extremely well known. Ormandy's 44-year tenure with the Philadelphia Orchestra began in 1936 and became the source of much of his lasting reputation and fame. Two years after his appointment as associate conductor under Leopold Stokowski, he became its music director. (Stokowski continued to conduct some concerts in Philadelphia until 1941; he returned as a guest conductor in 1960.) As music director, Ormandy conducted from 100 to 180 concerts each year in Philadelphia. Upon his retirement in 1980, he was made conductor laureate. Ormandy was a quick learner of scores, often conducting from memory and without a baton. He demonstrated exceptional musical and personal integrity, exceptional leadership skills, and a formal and reserved podium manner in the style of his idol and friend, Arturo Toscanini. One orchestra musician complimented him by saying: "He doesn't try to conduct every note as some conductors do." Under Ormandy's direction the Philadelphia Orchestra continued the lush, legato style originated by Stokowski and for which the orchestra was well known. Ormandy's conducting style was praised for its opulent sound, but also was criticized for supposedly lacking any real individual touch. In the book Dinner with Lenny, containing one of the last interviews of Leonard Bernstein, Ormandy is criticized by Bernstein for applying the same lush sound to every piece that he conducted, even if the composer of the piece in question did not call for it, a criticism that Bernstein voiced indirectly in The Sound of an Orchestra, one of the Young People's Concerts. Ormandy was particularly noted for conducting late Romantic and early 20th century music. He particularly favored Bruckner, Debussy, Dvořák, Ravel, Richard Strauss, Tchaikovsky, Sibelius, and transcriptions of Bach. His performances of Beethoven, Brahms, Haydn, and Mozart were considered less successful by some critics, especially when he applied the lush, so-called "Philadelphia Sound" to them. On the other hand, Donald Peck, principal flute of the Chicago Symphony Orchestra, reports that a fellow flutist was won over when Ormandy conducted the Chicago in Beethoven's Ninth Symphony; he told Peck that it was the greatest Ninth he had ever heard. He was particularly noted as a champion of Sergei Rachmaninoff's music, conducting the premiere of his Symphonic Dances and leading the orchestra in the composer's own recordings of three of his piano concertos in 1939–40. He also directed the American premiere of several symphonies by Dmitri Shostakovich. He made the first recording of Deryck Cooke's first performing edition of the complete Mahler Tenth Symphony, which many critics praised. His recording of Camille Saint-Saëns' Third Symphony received stellar reviews and is held in high regard. He also performed a great deal of American music and gave many premières of works by Samuel Barber, Paul Creston, David Diamond, Howard Hanson, Walter Piston, Ned Rorem, William Schuman, Roger Sessions, Virgil Thomson, and Richard Yardumian. Critics hate Ormandy. It must be the first "fact" they teach at critic school – always work in an Ormandy slam into every article you write. Record collectors hate him, too. I just don't get it. The film of him looks pretty impressive – classical and classy conducting technique, not at all showy. His Philadelphia Orchestra was the only real rival to Karajan's Berlin for sonic beauty in the 50s-70s, but was also a tighter and more versatile band. In 1947, Ormandy appeared in the feature film Night Song in which he conducted Leith Stevens' Piano Concerto, with Arthur Rubinstein as soloist. Ormandy visited Finland several times. 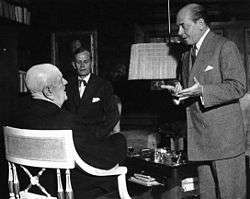 Here he is seen in 1951 with Jean Sibelius (left) and Nils-Eric Ringbom in Sibelius' home, Ainola. The Philadelphia Orchestra under Ormandy's direction frequently performed outside of Philadelphia, in New York and other American cities, and undertook a number of foreign tours. During a 1955 tour of Finland, Ormandy and many of the Orchestra's members visited the elderly composer Jean Sibelius at his country estate; Ormandy was photographed with Sibelius and the picture later appeared on the cover of his 1962 stereo recording of the composer's first symphony. During a 1973 tour of the People's Republic of China, the Orchestra performed to enthusiastic audiences that had been isolated from Western classical music for many decades. Ormandy and the Philadelphia Orchestra, as well as smaller ensembles composed of its members, often collaborated with Richard P. Condie (and later Jerold Ottley) and the Mormon Tabernacle Choir to produce many recordings still considered definitive today, most notably the Grammy- winning recording of the Peter Wilhousky arrangement of the Battle Hymn of the Republic. After Ormandy officially retired as music director of the Philadelphia Orchestra in 1980, he served as a guest conductor of other orchestras and made a few recordings. He also appeared as a guest conductor with many other orchestras. In November 1966, he recorded Antonín Dvořák's New World Symphony with the London Symphony Orchestra. This and a recording in July 1952, which he conducted anonymously with the Prades Festival Orchestra with Pablo Casals in the Robert Schumann Cello Concerto, represented his only commercial recordings made outside the U.S. In December 1950 he directed New York's Metropolitan Opera in a production of Johann Strauss' Die Fledermaus in English, which also was recorded. In 1978, he conducted the New York Philharmonic in a performance of Sergei Rachmaninoff's Piano Concerto No. 3, with Vladimir Horowitz as soloist for a live recording. In honor of Ormandy's vast influence on American music and the Philadelphia performing arts community, on December 15, 1972 he was awarded the prestigious University of Pennsylvania Glee Club Award of Merit. Beginning in 1964, this award "established to bring a declaration of appreciation to an individual each year that has made a significant contribution to the world of music and helped to create a climate in which our talents may find valid expression." Named Broadcast Pioneers of Philadelphia's person of the Year in 1979 and inducted into their Hall of Fame in 2003. Ormandy died of pneumonia at his home in Philadelphia, Pennsylvania, on March 12, 1985. His papers, including his marked scores and complete arrangements, fill 501 boxes in the archives of the University of Pennsylvania Library. Thomas Frost, the producer of many of Ormandy's Columbia recordings, called Ormandy "...the easiest conductor I've ever worked with — he has less of an ego problem than any of them... Everything was controlled, professional, organized. We recorded more music per hour than any other orchestra ever has." In one day, March 11, 1962, Ormandy and the Philadelphia recorded Sibelius's Symphony No. 1; the Semyon Bogatyryov arrangement of Tchaikovsky's Symphony No. 7 (for which Ormandy had given the Western hemisphere premiere performance); and Delius's On Hearing the First Cuckoo in Spring. The orchestra's performing venue at the Academy of Music (Philadelphia) was seldom employed for recording, because record producers believed that its dry acoustics were less than ideal. Moreover, Ormandy felt that the remodeling of the Academy of Music in the mid-1950s had ruined its acoustics. The Philadelphia Orchestra instead recorded in the ballroom of Philadelphia's Broadwood Hotel/Philadelphia Hotel, the Philadelphia Athletic Club at Broad and Race Streets, and in Town Hall/Scottish Rite Cathedral on North Broad Street near the Franklin Parkway. The latter venue featured a 1692 seat auditorium with bright resonant acoustics that made for impressive-sounding "high fidelity" recordings. A fourth venue was the Old Metropolitan Opera House used for later EMI recording sessions. Recordings were produced for the following record labels: RCA Victor Red Seal (1936 to 1942; 1968 to 1980), Columbia Masterworks Records (1944 to 1968), and EMI/Angel Records (1977-on). Three late albums were also recorded for Telarc (1980) and Delos (1981). Ormandy's first digital recording was a performance of Béla Bartók's Concerto for Orchestra for RCA in 1979. His recordings of Camille Saint-Saëns' Symphony No. 3 'Organ' were considered the best ever produced by Fanfare Magazine which remarked of the recording with renowned organist Virgil Fox: "This beautifully played performance outclasses all versions of this symphony." The Telarc recording of the symphony with Michael Murray (organist) is also highly praised. Dmitri Shostakovich, Cello Concerto No. 1, Mstislav Rostropovich (cello). Columbia, November 1959. Ormandy also conducted the premiere American recordings of Paul Hindemith's Mathis der Maler symphony, Carl Orff's Catulli Carmina (which won the Grammy Award for Best Classical Choral Performance in 1968), Shostakovich's Symphonies 4, 13, 14, and 15, Carl Nielsen's Symphonies 1 & 6, Anton Webern's Im Sommerwind, and Krzysztof Penderecki's Utrenja. Ormandy also commissioned a version of Mussorgsky's Pictures at an Exhibition which he and the Philadelphia Orchestra could call their own, since the Ravel arrangement was at that time still very much the property of Serge Koussevitzky, who had commissioned it, made its first recording with the Boston Symphony, and published the score. So Ormandy asked Lucien Cailliet (1891–1984), the Philadelphia Orchestra's 'house arranger' and a member of its woodwind section, to provide a new orchestration of Pictures at an Exhibition and he conducted its premiere on 5 February 1937, recording it for RCA Victor later that same year. (It has been reissued on CD by Biddulph.) However, Ormandy eventually returned to the Ravel arrangement and recorded it three times (1953, 1966 and 1973). Ardoin, John (1999). The Philadelphia Orchestra: A Century of Music. Philadelphia: Temple University Press. ISBN 1-56639-712-X. American Record Guide: Eugene Ormandy. Washington: Heldref Publications. November–December 1999. p. 68. OCLC 23874797. Wikimedia Commons has media related to Eugene Ormandy. ↑ Townsend, Dorothy (13 March 1985). "Philadelphia Orchestra's Eugene Ormandy, 85, Dies". Los Angeles Times. Retrieved 2014-01-01. ↑ Betz, P.R. ; Carnes, M.C. ; American Council of Learned Societies (2005). American National Biography: Supplement 2. Oxford University Press, USA. p. 418. ISBN 9780195222029. Retrieved 2014-12-12. ↑ Ewen, David (1943). Dictators of the Baton. New York, Chicago: Alliance Book Corporation. p. 200. ↑ Rodriguez-Peralta, Phyllis W (2006). Philadelphia Maestros: Ormandy, Muti, Sawallisch. Philadelphia: Temple University Press. p. 149. ↑ Peck, Donald (2007). The Right Place, the Right Time. Indiana University Press. p. 83. ISBN 978-0-253-34914-9. "VFTP exclusive: The real Top 20 of Conducting. Part Three: 11-15". March 26, 2011. ↑ "Ormandy Given Knighthood". Pittsburgh Post-Gazette. June 21, 1976. ↑ "Leading clarinetist to receive Sanford Medal". tourdates.co.uk. Retrieved 2014-12-12. ↑ "Discography of Eugene Ormandy (1899–1985)". Archived from the original on 2009-10-25.